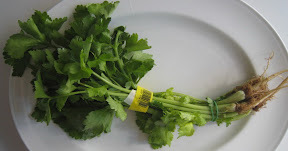 Chinese celery is used often in Thai spicy Salad, in steaming with the fish and in the stew. The taste and smell of all different types of celeries are mostly similar to each other, but I feel the smell of Chinese celery is a bit more intensive. The bigger type of Celery has a little tougher texture, more meat and a little sweeter and they are use in Western Cooking only. The Celery head that is used in the soups in Europe is not available here in Thailand. Apart from joining the other ingredient in cooking celery is now famous for making the juice. We talk only the stalk and the leaves cut in small pieces and add them in the juice maker, along with other fruit like apple and carrot. Some people like to juice them up with fresh bitter gourd. Celery contains Glycosides Apiin, Potassium and it is believe to reduce high blood pressure and help in the patients suffering from gout and rheumatic system.